As long as there have been skirmishes, there have been soldiers; primarily male. But throughout history there were women who also served in battle. Some of them outright, like Joan of Arc, and some disguised as males like the approximately 400 women who fought in the civil war. These many women, as well as volunteer nurses, cooks, and the occasional doctor on the battlefields, helped pave the way for women’s continuing and advancing roles in service to their countries. In the United States, in 1901, the Army Nurse Corps was established, followed in 1908 by the Navy Nurse Corps. 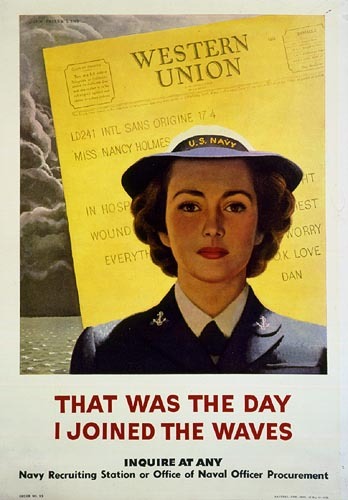 During WWII there were 60,000 army nurses and 14,000 navy nurses in the US military. But the British had women who served in nursing as well as other roles, and it caught the notice of First Lady Eleanor Roosevelt, an advocate for women's rights. It took a lot of work, but eventually the military branches had a place for women in service. In May of 1942, a year after it was introduced by Edith Nourse Rogers, a congresswoman from Massachusetts, congress approved a bill creating a branch of women other than nurses to serve in the army. The bill was signed by President Roosevelt and the Women’s Army Auxiliary Corps was established, with Oveta Culp Hobby as the first director. And although the women considered themselves army soldiers, they were civilians serving under the army umbrella. All of that changed in 1943, when a new bill in congress gave them military status. As such, the WAAC became the WAC – dropping the word “auxiliary”. An estimated 150,000 women were enlisted into the WAC. These were the women of the United States Navy who were recruited into service during WWII after a lengthy battle to get congress to pass legislation. As the Naval History and Heritage Command website puts it, “creative intrigue had to be used to get an authorization through The Congress.” July 30, 1942, President Franklin Roosevelt signed the legislation into law and the women’s branch of the navy began its recruiting efforts. Mildred McAfee became the first female commissioned officer in the United States Navy. She was sworn in as a Lieutenant Commander and was the first Director of the WAVES. An estimated 80,000 women served in the WAVES. In 1830, the coast guard’s Lighthouse Service was established and employed women. The first women to wear a coast guard uniform were Genevieve and Lucille Baker, nineteen year old twins who served as bookkeepers in 1918. Finally, in 1942, President Roosevelt signed an amendment that created the women’s coast guard reserve program known as SPAR. Dorothy Stratton, a senior lieutenant in the WAVES, was transferred into the newly formed program. As the director, she was promoted to lieutenant commander. She came up with the SPAR acronym, derived from the coast guard motto Sepmer Paratus, which is translated as Always Ready. 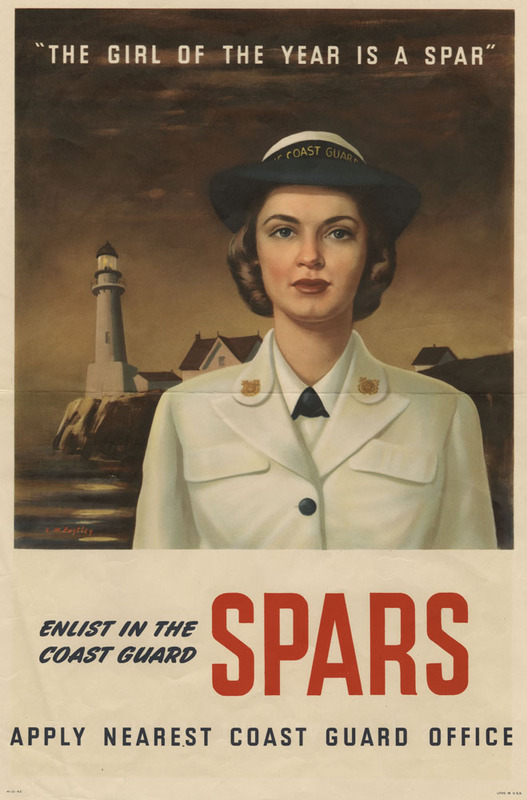 11,000 women served in SPAR during WWII. Women pilots were recruited into the WAFS in 1942, to deliver newly built planes to military bases. The forty women who served in the WAFS had to buy their own uniforms. A young pilot named Jacqueline Cochran** convinced the General of the Army Air Corp that the WAFS wouldn’t be able to supply enough women pilots. Because they didn’t want to recruit pilots into the WAC, the WFTD was created. The WFTD and the WAFS were merged into the WASP in 1943. In their sixteen month existence, they saw 25,000 women apply but only 1879 candidates were accepted. 1074 female pilots completed their training. In WWI, approximately 300 women known as Marinettes served in desk jobs to free men for battle. In spite of that, resistance to women as Marines was strong. Even in 1942 when President Roosevelt suggested women be recruited as marines, resistance was strong. The same law that established the WAVES, established a Marine Corps Women’s Reserve. It took a lot of pressure from the Secretary of the Navy, congress, and the public before the marines conceded. 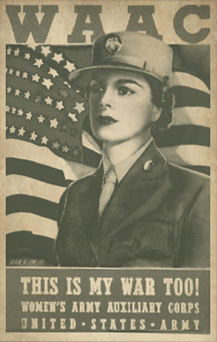 20,000 women served in the MCWR during WWII. It is estimated that 350,000 women served in the US Military during WWII, with approximately 400 casualties. 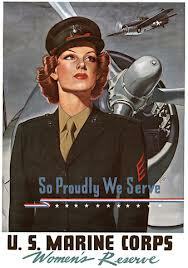 The Marine Corps Women Reserve poster stated it so well: "So Proudly We Serve." This post was written on Memorial Day and I'd like to thank all of the women and men who have served, and are currently serving, in the military - among them: my grandfather, father, uncle, brother, brother-in-law, cousin, and son. **Barring unforeseen circumstances, Jacqueline Cochran’s story will be continued here on June 18th, 2013. 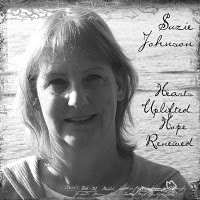 Wow, Suzie. This post is packed with cool info! What a tremendous amount of painstaking research went into this. And how inspiring these women are. There are definitely so many stories here, too. Sigh--always the writer. Thank you, Susie. Yes, I thought that, too. So many stories to be told, never enough time. As Suzie well knows, I'm a big fan of strong female heroines. Cool story. I love the vintage posters, too. Thank you, DeAnna. I love vintage posters. for a number of reasons but partly from hearing history from my mother about growing up and graduating during the war. It's an amazing chapter in our history and I thank you for bringing up all this information about the women who served!